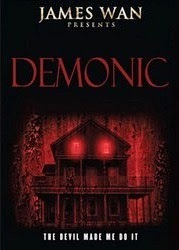 "Demonic" centers on the aftermath of a horrific massacre where five college students were brutally murdered inside an abandoned home. Detective Mark Lewis and psychologist Dr. Elizabeth Klein question one of the few survivors who explains they were amateur ghost-hunters, seeking out paranormal phenomenon at the abandoned house, which was believed to be haunted. But what started out as a harmless activity turned into something truly terrifying.